Baby Rhino Venus at Baby Rhino Rescue | Adopt and Donate Now! Venus came to Care for Wild Africa in October 2014. Her mother was poached in the Kruger National Park. She was about three months old. When she arrived she had a very badly injured foot which was covered in maggots. The underpad of her foot was almost rotten; infection had spread up her leg. It is a miracle that the vet, Petronel and the team were able to halt any gangrene from setting in. It was thought that it might take four months for her foot to heal and be strong enough to walk on. She had to wear a caste with dressings changed regularly. The good news is that her foot is almost completely healed, way ahead of schedule. Venus shares her enclosure and night pen with little Manji. 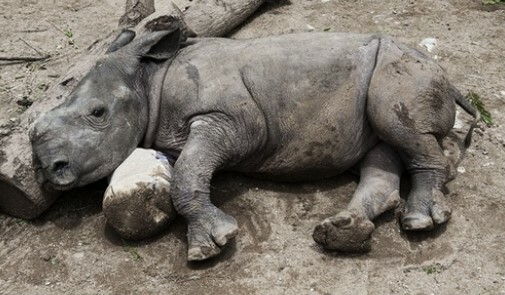 The two baby rhinos have been through very difficult times together, but they have come through beautifully. Venus only has to wear a protective shoe now and is able to walk normally. The two rhinos are let out of their enclosure twice a day and go for long rambles through the grass, where they graze and lie resting. Venus will not let Manji out of her sight, and the two are deeply bonded. 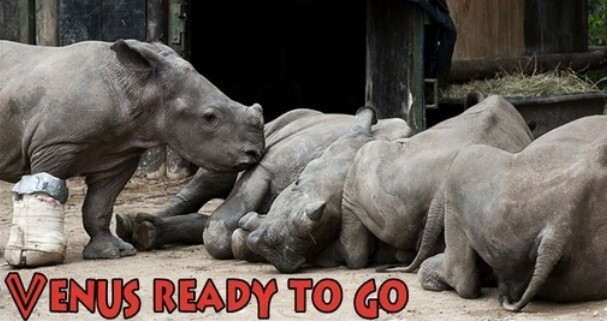 One of these days they will be transferred down to the bottom enclosures, where they will be able to mix with the other young rhinos during the day. For now, they stay in the “baby boma” so that their full return to health can be constantly monitored.